My mom kept notes and papers and wrote things down. I’m so glad she did, because from her scribblings on various bits of paper folded up and stuffed into random envelopes, I have gleaned this family farm history. After they were married mom and dad paid $4,500 for their first home. There was a hundred year old house and barn on 100 acres. The house was two story. They had no hydro for three years. They put cement on the cellar floor, built a garage, and shingled the house and the barn. There was an excellent cistern with soft water pumped into the kitchen (with a hand pump – I remember that.) Drinking water had to be brought over from grandma and grandpa’s farm, which was down the road and up a winding laneway. While they lived there, Dad served six years on the Saugeen Township Council. He’s the handsome one, front row, third from the left. Twelve years and three children later they moved to Aaran Township and a new and better farm. I barely remember that first house. I was five when we left it. The new place was nine miles from Port Elgin, 150 acres, had spring water, tap water to the kitchen, a full size bath and a half bath, 5 bedrooms and water to the barn. Incredible luxuries. Lot 1 Concession 3 Aaran Township was procured from the Crown April 21st, 1864 for the sum of $1,300. In 1866 James Esplen obtained possession. On the 26th of December 1885 James Esplen and his wife Margaret granted the farm to their son Alex Topp Esplen for the sum of $1000. He and his wife Sarah built the present brick house. In 1895 William James Esplen became the owner when his brother Topp Esplen died of T.B. The fine maple trees on both sides of the lane are a monument to this man’s thoughtfulness. He and his wife Jennie had one son, George, who died at the age of 21 with T.B. The name Springbank Farm was given to the property because of the many springs scattered over the farm. 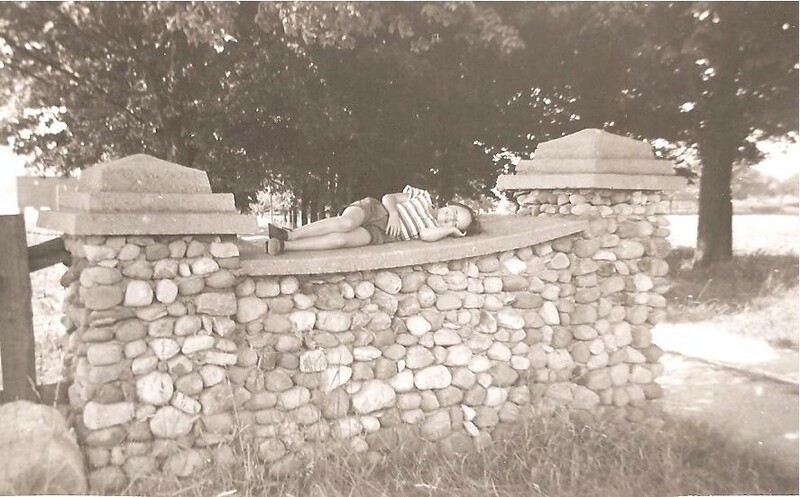 When the school was located across the road the children always came across to get a drink from the bubbling spring beside the house. There was a fine orchard at the east side of the buildings until the hard winter of 1934 when many trees were killed by the frost. The Mills wired for hydro in 1939. In 1941 renovations were made to the barn and the south wall was extended and covered in. (Now I understand why half of the house sloped to the south, if that part was added later. It was an impressive addition, doubling the size of the original house and adding another veranda and eventually a garage.) At the same time, stone gates were placed at the road. A cement silo was built in 1949. In 1943 the pressure system and bathroom were installed. 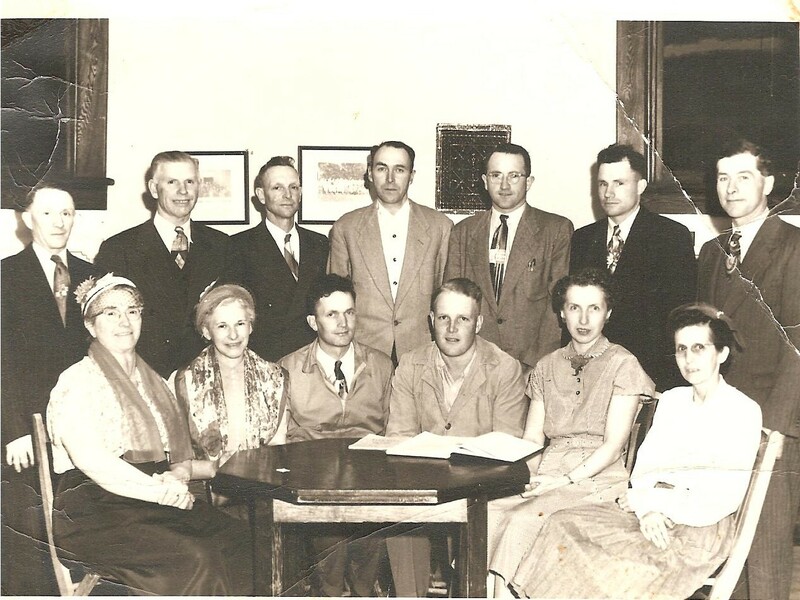 In 1951 Harold Mills and his wife Marion Mills took possession of the farm and the Mills Senior moved to their new home 1/2 mile south on the B-line. Two years later on March 30, 1954, they sold the property to Harold McArthur of Saugeen Township. He moved with his wife Margaret, and family, Ron, Linda and Ann, during Easter week. They were joined in June of that year by Mr. and Mrs. W. J. Scott, Margaret’s parents. Mr. Scott passed away May 25th, 1957. A daughter Verna was born on November 30th of that year. Extensive tile drainage was done in 1961. The Bruce Municipal Telephone installed dial type phones in August of 1985. Mom has added on another scrap of paper that moving day was April 19th, Ron’s 8th birthday. Linda was 5, Ann was 2. They paid $13,000 for the farm. Murray Adis moved with us. (I don’t think he was there very long because although I remember his being with us at the other farm, I don’t recall him living with us at the new one. But I was only five and not paying attention, as usual.) Grandma celebrated her 90th birthday in 1977. 1976 – June – drove with Edna and George to Edmonton, went to Cambridge Bay to see new grandson Kristofor. 1978 – Took Spencers to Kenora and stayed weekend at Marguerite’s with Newton and Marie. 1980 – End of May went to Montreal, New Brunswick, P.E.I., Nova Scotia, Newfoundland, New England, Lake Placid with Edna and George. 1981 – June – went to Mabels, Milton, Toronto, Lindsay, Ottawa, Haliburton, etc. 1982 – Family had surprise for 40th anniversary. Brian was born. F.W.I.C. Convention in Fredericton with Iris Coyne. Steel roof on the south side of the barn and shed. 1983 – Private lines installed by Bruce Municipal Telephone. No more party lines. Free long distance to Paisley, Kincardine, Tiverton and Southampton. Cleared away remains of poplar trees at gateway to east hundred. Very old. V. married September 10th. 1984 – First crop of plums from trees planted five years before. Tremendous crop! Township widened and built up our end of the B-line. Hank built new fence around S.W. field. Big improvement. Grandma went to hospital May 19th. Got a new phone – no push button. 1985 – Logs taken out of bush. Mother (grandma) died in June. Steel roof and new beams on lean-to beside shed. New beam in barn. Barn rewired. Limbs (tops) sold for wood and also for our own wood. Another record crop of plums and raspberries. Trip to Yellowknife with Gammies going to Edmonton. (That would be to visit us! Dana was 11 and Kris 9.) Five loads of pit run gravel on lane and 3 loads gravel to build up and widen lane. Trip to Lake Erie with Edna and George. 1986 – New electric wire from barn to shed Steel covering on shed. Fence put up on NW field on B-line. Dug out cellar drain that crosses lane, west. Hank cut down big tree in S.E. corner of lawn. It was dying. Trip to Manitoulin with Gammies and Bessie. Redecorated living room – put in carpet. (Hardwood floor no more.) Ann got the piano. Trip to Jean’s in Ottawa to get May. Put new flooring on front veranda, more gravel in lane. Kimberley Ann born August 21st. Ron’s moved. Ann’s had Christmas at Linda’s. 1987 – Re-did downstairs bathroom, removed black and white tiles. Trip to Dryden for Marguerite’s funeral. To Thunder Bay in July for Newton’s funeral. Trip to Sherwood Park in September. Got microwave for birthday. (That would be her 70th!) Trip with Edna and George to North Bay, Bracebridge and Marilyn’s. New kitchen table and chairs. 1988 – Picked 16 ice cream pails of raspberries at one picking. Three door new freezer/fridge. Hank bought 20 cattle at Little Current sale. Linda here for Hobby Fair week, rest of time in Kenora. Went to Linda’s end of August. 1989 – More big Manitoba Maples had to be cut down. Rows and rows of beautiful glads (gladiolas). Ann had 75th birthday party for Hank at her house. To Thunder Bay with Andy for Lori’s wedding in September. Gammies trip to Killarney Algonquin Park. In December Hank to hospital, had operation on the 14th. Murray did chores. 1990 – Had windows caulked and bricks treated with silicone, $1334. Big crop of grapes. Took winter’s wood out of bush again. Hay off in shares – we got 30 round bales. Very open fall. Linda, Dana and Kris home for 2 weeks in summer. Many more glads. Most grapes ever. 1991 – Steel roof on house coated, $1200. Still have black currants from 30 year old bushes. Hay off again in shares. Painted house. Hank fixed lane fence and east field road fence. Fixed barn and yard fence. Trip to Sherwood Park in May. Beautiful crop of asparagus. Marie and I saw “12th Night” at Stratford Theatre. Kitchen ceiling marbled (plaster). Papered kitchen. Ron got glass in eye from hockey puck. Poor price for cattle. Men came to repair leaking roof. Three loads gravel in lane, 1 fill for ditch. New chain saw. 1992 – Another good winter with less snow for another year. Tapped trees in lane. (I remember mom telling me that dad had taken up boiling sap to make maple syrup. She said it turned out to be an excellent way of removing wall paper with all that moisture in the air.) First time in our 50 year marriage that we had no cattle to winter. Maple tree at gate to come down. Painted north side of barn roof. The rest of the notes are much more detailed and turn into a sort of diary after this. There’s less about the farm and much more about life. I’ll turn all that into another “page” one fine day. This is great. I am trying to do something similar on my blog… memories for my kids and grandkids, family history, etc. My parents did not keep good notes like this, though…. I don’t think my mother had any idea when she started writing things down how treasured they would become. I’m trying to keep up what she started. so interesting…your Mom was a writer…like you! And there are some grandchildren that show real promise too – and will likely outdo both of us. That would make me extremely happy. Thank you for the follow and stopping by…..
Scribbles that tell a story. Nicely done. It was my mother and dad (Harold and Marion Mills), that your folks bought the farm from. I believe we may have met when the Ebenezer Cemetery was re-dedicates many, many years ago! 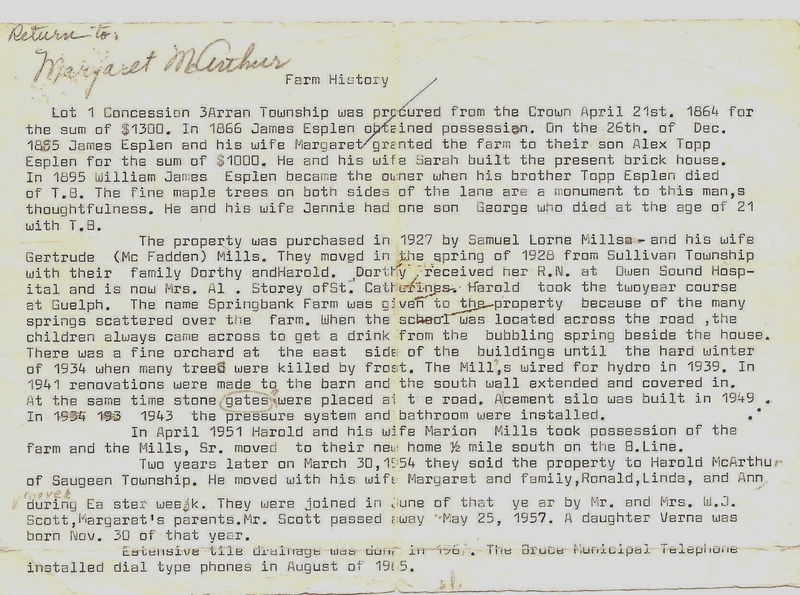 It was great getting that history of the farm – glad your mom made notes because we have no such history. It was sad to see the barn down but the spring still burbles away and the house is rather desperate. By the way, the Mills’ senior called it MillsSpring Farm. What a small world we live in! Thank you so much for your comment. I don’t remember anything about the Ebenezer cemetery, but it is very likely you met my sister Ann who still lives close to Southampton. Yes it was sad to see the barn go and I expect the old house isn’t long for this world now either. Nothing can take away the memories though. It was a great place to grow up. I’m so happy to share this little history with you and get your most welcome feedback.